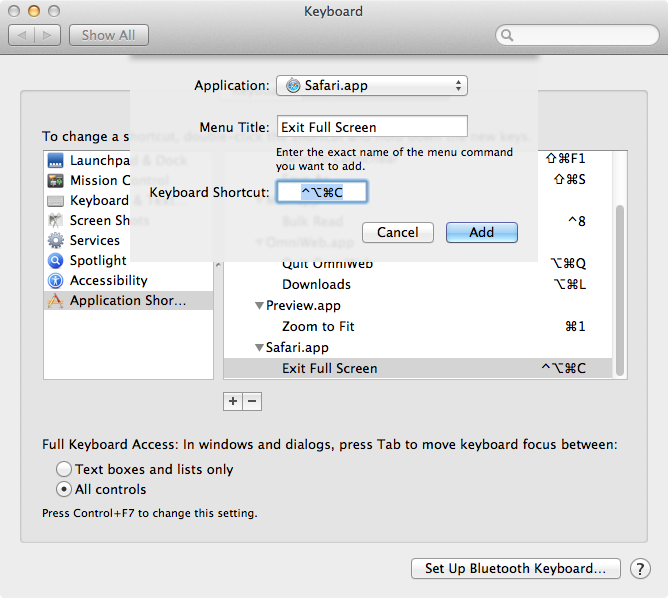 Some apps (Safari, iTunes...) quits fullscreen mode on Esc keyboard shortcut. Is there a way to disable it? It interferes e. g. with web apps control resulting in unintentional quitting fullscreen when you just hit one more Escape than you should. Good question. Before browser makers figured out cmd-q was awfully dangerous without at least a prompt that the user really wants to close 60 tabs, I always changed the keyboard shortcut for the Quit command on my main browser. You can disable shortcuts via Keyboard Shortcuts. Click Keyboard Shortcuts in the top pill shaped tab. Click the Applications Shortcuts icon in the left hand column. Choose Safari from the drop down menu of offered applications (looks like the default list is applications which have been opened in the last three months). Enter the exact name of the menu item you wish to disable. In this case "Exit Full Screen". Add an alternative keyboard shortcut (in this illustration, I added Ctrl-Opt-Cmd-c) This is what the finished result looks like. Test (alternative Application Shortcuts do now always work exactly as planned). You can do the same thing with Keyboard Maestro (and much much more). Apple's feature is probably taken/adopted from Peter N. Lewis's implementation (which existed for many years before Apple came up with the feature in Snow Leopard). 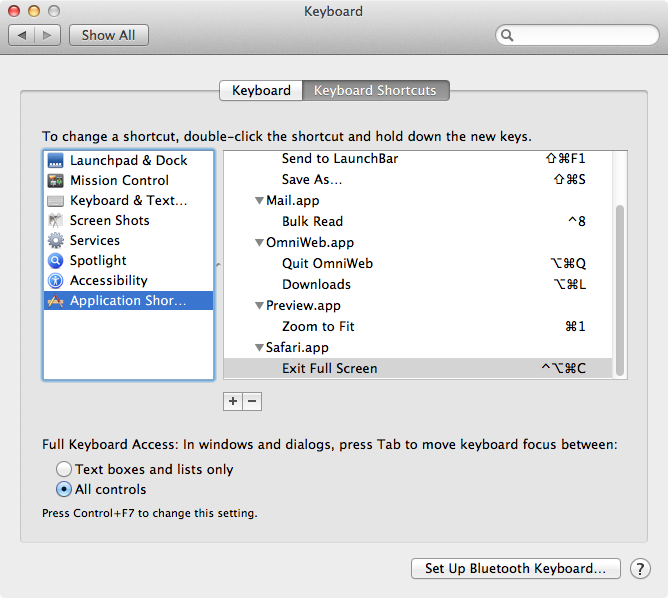 In Keyboard Maestro, you can also assign the same shortcut to multiple applications. In Keyboard Maestro, you can also take over keyboard commands which do not have menu items (complex applications like Photoshop come to mind: there are so many commands that many of the commands have no menu equivalent). It's also easier to move these preferences around from computer to computer if you are using Keyboard Maestro. On the other hand the Apple version exists on all Macs past 10.6.8, including your less technical girlfriend's MacBook Pro. I use both depending on whether I want a quick fix or if I'm building permanent tools/shortcuts for an application I use professionally on multiple computers. Keyboard Maestro does far more than just substitute keyboard shortcuts: you can write sequential macros with pauses to automate what would otherwise be five or ten keypress and click type actions, i.e. 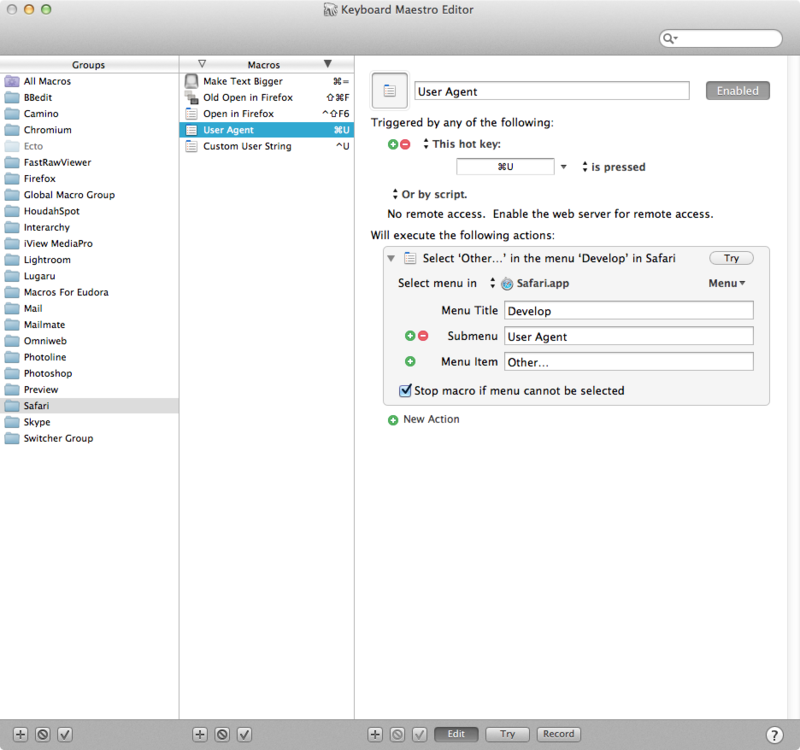 redirecting, address and send email to someone else in the company with a single keyboard command. To avoid the situation when the whole app quits fullscreen mode when you accidentally hit ESC twice you can learn to use a different key. Cmd-. will quit web apps that are in fullscreen (e.g. YouTube) but will not perform any undesirable actions when used twice. Not the answer you're looking for? Browse other questions tagged keyboard fullscreen . How can I show multiple windows of a single app with a keyboard shortcut?